I've never been to Brighton before. According to the map the Concorde2 venue in Brighton, where Delirious? were opening their UK tour on Friday, is right on the sea front. So as I drove in to Brighton it wasn't hard to get myself in the general vicinity of the venue. But after I parked the car and looked around I couldn't see where it was, so I headed West along the sea front in search of it. Having reached Brighton Pier and still not located it, I decided I was heading in the wrong direction and so turned round and headed East. Back past the car again and eventually I saw the Concorde2. As I stood outside the venue I could hear support band Tree63 doing their sound check inside. I phoned Jon only to be told that he'd walked into town for dinner. "Come and join us" he said. So, I retraced my steps back along the sea front to the pier again! Then, following the directions Jon had given me on the phone I turned inland and walked into town. After a while my phone rang and Jon asked where I was. "Umm, somewhere in Brighton" I said, "There's a big church in front of me". "Turn left, up the hill" Jon instructed. So I took the next left and kept going. A little while later Jon called again, "Where are you now?". "Umm, somewhere in Brighton. There's a railway bridge in front of me" I said. "You're miles off track" Jon said, "Stay where you are, I'll come and find you". So I stayed put, and sure enough a few minutes later I saw Jon walked up the street towards me. He led me through the lanes of Brighton to a Noodle restaurant where Paul and Stu were waiting. Taking my seat I was slightly alarmed to see chopsticks in front of me. Not exactly my forte. But to my relief when my meal arrived it was accompanied by a good old fashioned fork. As we ate Jon gave me the surprise news that the band would be announcing the release of Love Will Find A Way as a single. Having spent the past few weeks trying to convince a few people on the forum that a new single was neither likely nor a good idea, I was slightly taken aback to hear the news. It seems the band and their label want to tap into the fans passion for one last chart effort. Jon told me that they want to finish as if they're not finishing. I suppose that means not winding down to a slow end, but keeping the momentum going right to the end. As for what will happen in 2009, that's still to be finalised. Apparently they'll play about 30 concerts in total next year before calling it a day. There's some talk of a final tour, or a set of dates in the UK, but nothing concrete yet. (There is a big outdoor event though which Delirious? 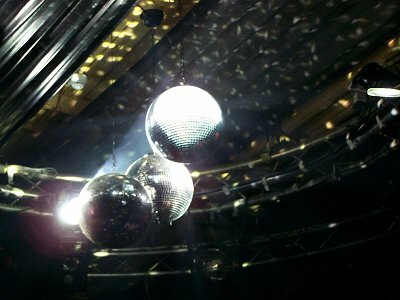 will be playing at on May 24th at Wiston House in Sussex). It was good to chat to Paul a bit about how he has found it fitting into the band since taking over from Stew. He told me about getting mobbed at the airport in South America a couple of weeks back, and about shooting the new live DVD in Colombia. By about 7:30pm the guys were itching to get back to the venue, opening-night nerves were kicking in. As we walked back through the streets of Brighton, this time taking the direct route instead of my rather protracted route of earlier on, Paul and Jon turned tour-guides pointing out the sights of Brighton. 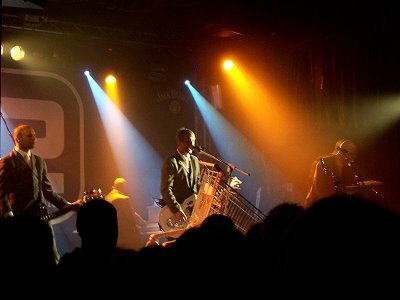 As we arrived back at the Concorde2 I left the guys to head round the back to prepare for the gig, while I went in through the front door to collect my guest pass. Thankfully there was none of the usual body searching, complaints about carrying a camera or moans of "which list are you on?" that are normally associated with me trying to get into a gig. Once inside I was struck by; a) how small the venue was, and b) how packed the venue was. Tree63 were already half way through their set by now and I was stood at the back of the crowd with no easy way of getting anywhere near the front. I spent the next 10 minutes slowing working my way nearer the front in an attempt to have at least some chance of taking half decent photos of Delirious? I was impressed with how well the crowd knew Tree63's songs, and the band were sounding very good indeed. By the time Delirious? came on stage the temperature in the room was both metaphorically and physically sky high. The only down side of the set was the surprising lack of recognition from the crowd when Deeper started. Normally it only takes a couple of notes from Stu's guitar for the crowd to start jumping and cheering. But half of the crowd didn't even seem to know what the song was, let alone jumping to it. On reflection I think Martin's observation later that "the front row seems to change every couple of years" was spot on. New fans come along and don't know some of the older songs that for years have been a stable part of the Delirious? diet. Interesting how things change. 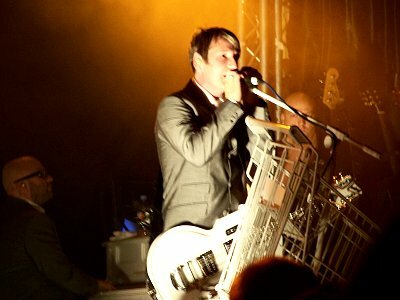 Martin's shopping trolley microphone stand was an unusual idea. I think it might be just a little too big and clunky to work as a stand, and maybe in conjunction with a few other Kingdom Of Comfort props it might have worked better than on its own. 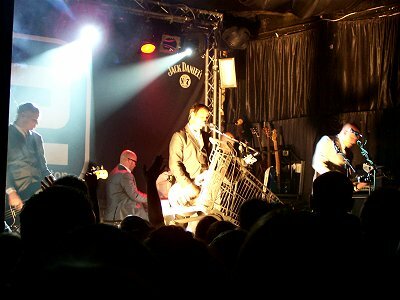 But apart from that it was a very well received show to kick off the UK Tour.